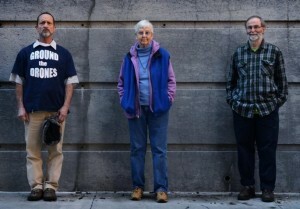 Release Sister Megan Rice, and the "Y-12 Three"
On May 8th, an appeals court overturned the convictions of Sister Megan Rice, Greg Boertje-Obed and Michael Walli, members of the “Transform Now Plowshares” movement, on sabotage crimes relating to their acts of civil disobedience against nuclear war and in favor of peace. They also ordered that they be re-sentenced for a lesser crime of “injuring government property,” which was upheld. An anti-nuke nun may soon be blessed with freedom. 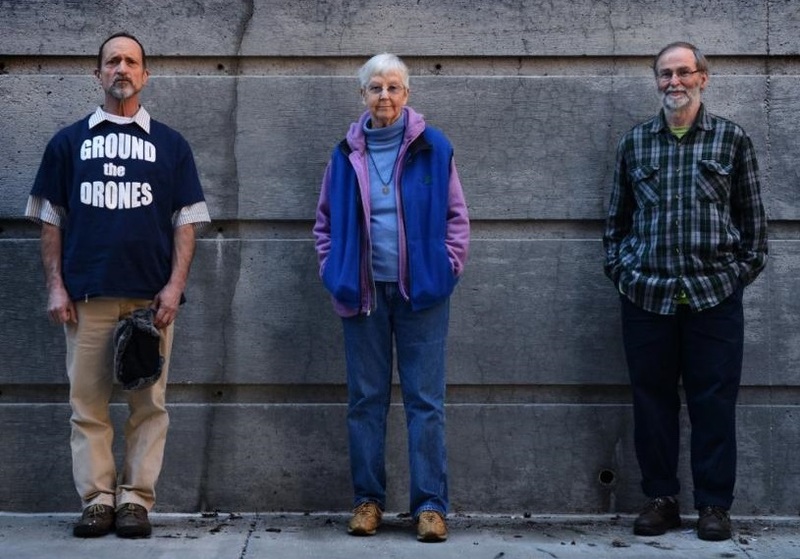 An appeals court has overturned the sabotage convictions of an 85-year-old nun and two fellow Catholic peace activists who broke into a weapons-grade uranium facility and splashed blood on the walls. 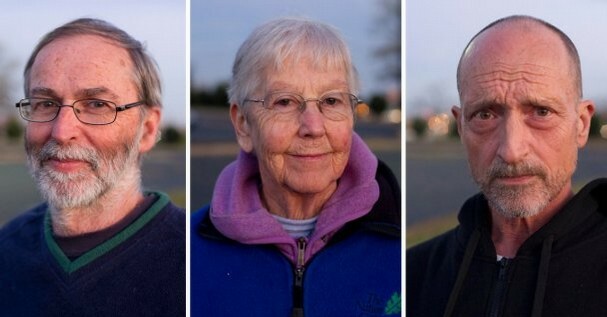 But Sister Megan Rice, locked up in the Metropolitan Detention Center in Brooklyn for the past two years, 66-year-old Michael Walli, and Greg Boertje-Obed, 59, are not totally in the clear yet. A panel of the 6th U.S. Circuit Court of Appeals ruled in a 2-1 decision Friday that the three did not injure national security when they cut through several fences and broke into the Y-12 National Security Complex in Oak Ridge, Tenn., in July 2012. Their aim was to bring the dangers of unimpeded nuclear proliferation to people’s attention. The government had 14 days (as of May 8, 2015) to file an appeal to the U.S. Supreme Court in an attempt to have the convictions reinstated. I don’t have a lot of faith in the government in general or in their willingness to back down rather than fight to the bitter end to force compliance with their authority, but I have some personal reasons (read below for more on that) to hope they will, since I actually know Sister Meghan and consider her a friend. Sister Meghan and the others convicted with her are nothing short of political prisoners, who (as the appeals court acknowledged) were given inflated charges based on the political messages they expressed with their protest and the defiance they displayed in the process, as well as the embarrassment the ease with which they carried it out caused to those tasked with guarding America’s war machines. They should be released immediately. Sister Megan Rice, a Catholic nun and long time member of the Catholic Worker movement, is one of the nicest, kindest, most soft-spoken people you would ever meet. She’s also one of the toughest and most morally grounded people you could ever be lucky enough to know. I first met her when she was living in Las Vegas and I was involved in helping to re-establish the local Food Not Bombs group here, back in late 2008. Sister Megan and other members of Las Vegas Catholic Worker were among those that had supported Food Not Bombs Las Vegas when the City of Las Vegas passed laws making it illegal to share food with hungry people, specifically with people who “a reasonable, ordinary person would believe” needed that food. Before that, she spent 40 years as a schoolteacher and relief worker in some of the poorest areas of Africa, until bouts with malaria and typhoid fever forced her to return to the United States. From the first time I ever met her at a local coffee shop where we held the Las Vegas A-Cafe at that time, Sister Megan was never anything, but pleasant, friendly, and helpful. However, even as apparent as her good nature was, you could see and hear the strength of her character just as easily. She was the kind of genuine person that you respected as soon as you met her. Through involvement with Food Not Bombs and other peace groups, as well as my own personal advocacy, I have often worked with Catholic Worker and other faith-based groups in the Las Vegas area, such as Nevada Desert Experience and Pace e Bene, that are associated with them. As a result, I had a fair amount of interaction with Sister Megan during her last couple of years in Las Vegas. During that time, my respect and admiration for her never ceased to grow. Her peaceful, yet determined, demeanor was always both inspirational and educational. Talking to her at regular “everyday” events was always a pleasant experience. On the other side of the coin, witnessing how she never let fear of punishment deter her from standing up for the right thing and was always willing to accept the consequences that might come, regardless of how overblown or draconian they might have been, was something that always strengthened my own resolve. Toward the end of her time in Las Vegas, I attended the trial of the “Creech 14,” who had been arrested for stepping too close to the gate of Creech Air Force Base (where most of the U.S. drones are operated remotely) in order to protest the murders of people in other countries (including women and children) by people just north of Las Vegas. Sister Meghan (as well as the rest of the defendants) never backed down from her principles or recanted their beliefs as unjust, but simply made the argument that their actions were based on a duty to defend innocent people. It seemed fairly obvious, that even the judge was sympathetic to their arguments, which included testimony from Former Attorney General Ramsey Clark on their behalf. Of course, when you are accused of challenging the government’s war machine, no judge will side against their employer and its biggest source of income, regardless of their potential sympathies for the accused. Especially in what was really a very minor case that was being used as a sort of show trial to discourage future activism against Creech’s drone murders. When I spoke to her after the trial on the phone, instead of being upset (like I was) or even disappointed that they were convicted, she was actually cheerful and talking about moving onto the next fight. Not long after that, she left Nevada and shortly thereafter became involved in the biggest and most principled fight that anyone I know personally has ever undertaken. At a time when most people are relaxing in retirement, Sister Megan actually shut down a nuclear weapons manufacturing facility. 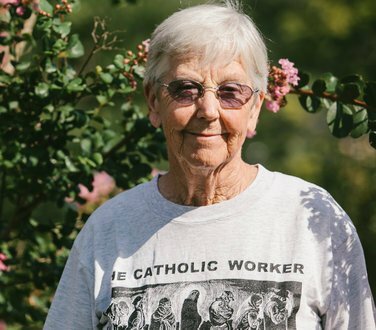 Along with Greg Boertje-Obed and Michael Walli, of the “Transform Now Plowshares” movement, the (at the time) 82 year old nun entered the Oak Ridge (TN) National Laboratory, hung protest banners, poured blood on the walls, and spray-painted antiwar statements on buildings. The ease with which they entered what was supposed to be a highly secure nuclear weapons facility and the very public nature of it, this particular action not only challenged, but very much embarrassed the U.S. Government. That public shaming of the United States’ war apparatus and it’s very lax security was their real “crime.” Outside of that, all the three pacifists had committed was trespassing and what would be a stretch to call vandalism, since no actual property was damaged. In spite of that, they were branded as “violent terrorists” by the Federal Government and charged with felony crimes. This was much more a case of saving face over the exposure of just how easy it would be for someone with real harmful intent to walk right onto a base filled with nuclear materials (they actually had to approach a security guard working there and alert him to their presence) than any real danger that they had ever created with their non-violent actions. As was the case in previous acts of civil disobedience, rather than back down from her convictions and beg her captors for leniency, Sr. Megan and the others reaffirmed their commitment to direct action and even informed the judge after their conviction that they would resume such activity upon release, stating that the only way to stop them from advocating for peace would be to give them a life sentence. At the time, they were in fact facing what amounted to an actual life sentence (a 30 year maximum), due to their ages. Although it is still a travesty that she should have spent even a day in jail, the judge fortunately didn’t heed their advice in that respect and sentenced her to 35 months, along with sentencing Boertje-Obed and Walli to 62 months each. 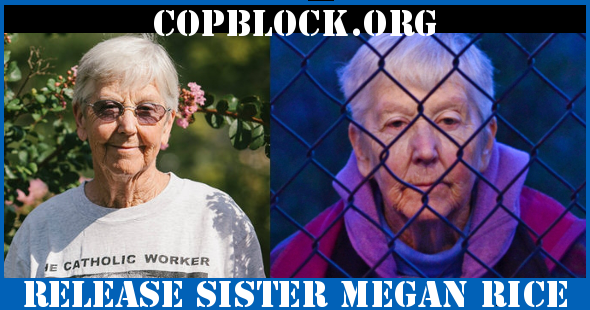 As the Daily News detailed earlier this year, Sister Megan has since been confined to a “Brooklyn hellhole,” crammed with 111 other women into an unsanitary, inhumane single room prison unit at the Metropolitan Federal Detention Center in New York City. That sort of humility, determination, optimism, and caring spirit is what I noticed and admired almost immediately when I met Sister Megan. And it’s what has caused me to take inspiration from her and become determined myself to continue fighting for that change. Throughout my life and especially since I became involved in activist causes, I’ve been very fortunate to meet a variety of amazing and inspiring people that have left permanent impressions on me and helped to shape my character in a positive way. Sister Megan is someone I place among the top of that list. She and her fellow peaceful “terrorists” should be released right now, not so much because she personally needs or would likely ask for that on her own behalf, but rather because those of us out here need people like her standing with us.